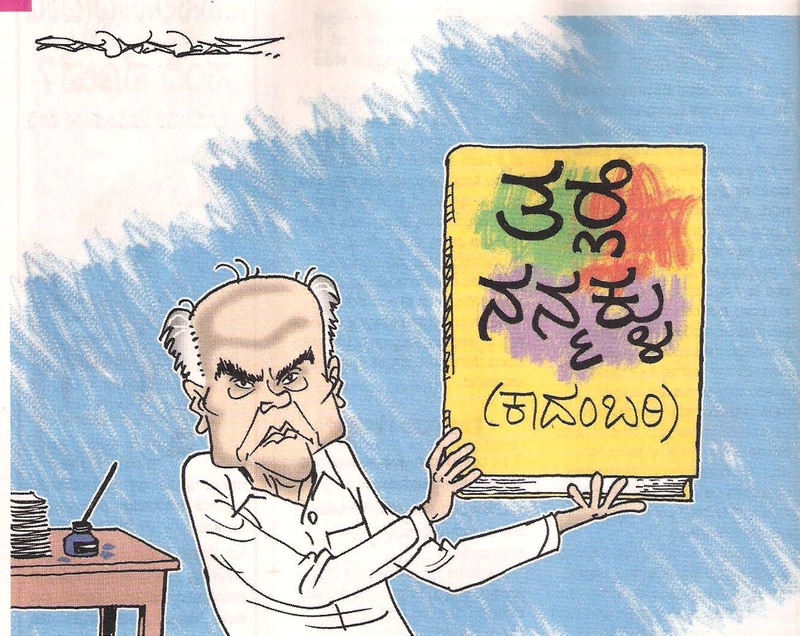 The book Bhyrappa won’t be writing? Or will he? Deccan Herald and Praja Vani cartoonist P. Mahmud‘s take on the writer S.L. Bhyrappa‘s description of the people of Karnataka as tarlegalu (a bunch of good-for-nothing whiners), in the weekly magazine, Sudha. Also read: Did Adolf Hitler fetch S.L. Bhyrappa‘s freedom? This entry was posted in Issues and Ideas, Kannada & Karnataka, Literati and tagged Churumuri, Deccan Herald, P. Mahmud, Praja Vani, S.L. Bhyrappa, Sans Serif, Sudha, U R Anantha Murthy. Bookmark the permalink. Prajavani was the one to make headlines of his statement. I dont know if there is any conflict of ideas between SLB and editorial board of PV/DH. Otherwise, there is no need to make it look all this serious. PV is also publishing the “intellectual” Gireesh Karnad’s auto-bhaya-graphy in its Sunday edition. Seems PV is playing its secular cards subtly…. Another bout of Bhyrappa Bashing??? BTW, Churumuri, any postings and your thoughts on the so called Hindu Terrorism quoted by Rahul G???? What Bhyrappa has said is true of Kannadigas. It is not fair to take out a piece out of context and criticise or condemn him. We have a lot to learn from Tamil Nadu. Whatever the party comes to power there, it has not igrnoed the State’s development. They have even taken away projects of other States, while we have been opposing or fighting on silly issues, pulling down each other like the frogs in the well. Sad indeed! The attacks which followed the press reports prove a point! Prajavani is not against Bhyrappa but his turn against minorities and feminists. Bhyrappa is against all basic human rights. Prajavani is just exposing his acts. author par excellence, personally a big fan of him, but sadly his statement supporting yeddyurappa,gadkari and forcible,illogical land acquisition has really shocked me. tragedy of kannada cultural world that a great writer turns mouth piece ofa corrupt establishment. I fully agree with Gauri Satya. Vasanth’s opinions that Bhyrappa is against all basic human rights, Prajavani is exposing his acts and just ridiculous are funny, childish and ridiculous to say the least. Bhyrappa has later issued a statement, which people might not have read. What Bhyrappa has said is not anything derogatory against Kannadigas. The socalled seculars are jealous of Bhyrappa and they are the one spreading such canards and gullible people in their over enthusiasm to ‘protect’ Kannada fall for it. I don’t think that the translation of ‘Tharlegalu’ as good-for-nothing-whiners is correct. ‘Irritants’ is more appropriate. is this the reason why old ones get thrown out of houses ? I am still sympathetic for stress they took when young which didn’t turn successful which has led to whining. Rahul Gandhi is a traitor and a terrorist. He is clearly on the side of the Pakistani Army/ISI who are saying the exact same thing. He is batting for them. This SOB needs to be hunted down like the mangie dog that he is. Way to go HLB!!! This is so true about kannadigas!!! Most kannadigas think they are beyond criticism. I can’t help but appreciate hlb’s courage in telling the truth!! Most of us r useless whiners. Dr ramesh u r 100%correct. These so-called literary giant think themselves superior and expect whatever they say should not have any repercussion. byrappa just to appease his right wing leaders, some crooked ideology of rss, vhp and some corporate giants , he ridiculed whole kannada communities and particularly farming communities. It is become fasion for from elite(I don’t think them so) class to ridicules these poor communities when latter show resistance to the acquisition of their properties. The concept of development in India is so skewed and flawed :- whatever the action done by corporate giant , irrespective of wheter it is bound to law or not and only going to benefit to hand few of people, leaving thousands of people to loose their livelihood at throw away prices which are orchestrated by the middleman- state government who are already sold out to these giants. And hey, whether SL Byrappa giving tough competetion to Neera Radia in lobbying for corporates. the only differense is the latter did that living unknown to the vast section of the people, while SLB doing this openly by criticizing the vast section!!!. he has the mask of literal background and anyone who protest against him will face backlashing from his supporters.then god can save karnataka from these people. Just as AP is the Gujarat of the South (almost, although not there yet) pragmatic and successful. SLB who is truly the heir of Dr. Shivram Karanth and a true litteratauer unlike shallow poseurs such as Karnad and URA; has hit the nail on the head. We Kannadigas are whiners, and like Bengalis like to say among themselves, we are crabs, we like to pull down anyone climbing out of the muck. We will only be happy with a corrupt buffoon like Deve Gowda in power who runs this state down to the ground. SLB should be made official propaganda minister of RSS/VHP/BJP. Shuddha tarle. ದಯವಿಟ್ಟು ಮಾತಿನ ‘ಅರ್ಥ’ ಎಂದರೆ ‘ವಾಚ್ಯಾರ್ಥ’ ಮಾತ್ರ ಅಲ್ಲ ಅಂತ ತಿಳ್ಕೊಳ್ಳಿ…..
ಇಲ್ಲಾಂದ್ರೆ ನಿಮ್ಮ ಅರಚಾಟ ನಿಮ್ಮ ‘ಪಕ್ಷ’ದವರ ಖುಷಿಗಾಗಿ, ನಾಲಗೆಯ ತೀಟೆ ತೀರಿಸಲಿಕ್ಕಾಗಿ ಎಂದು ಚಿಕ್ಕ ಮಗುವೂ ತಿಳ್ಕೊಳುತ್ತೆ…. According to SLB- all kannadigas are tharlegalu-including SLB.